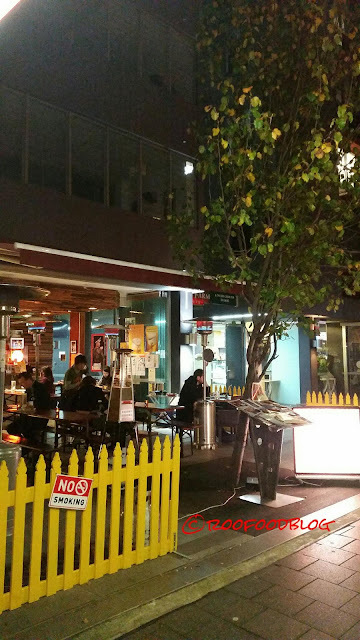 With my ever developing curiosity of Japanese cuisine and more about the regional eats rather than just on a whole I was excited to be invited to dine at Osaka Bar, a Japanese casual dining spot in Potts Point that is focused on Osaka street food (or drinking food if you will). The funny and effervescent Chef Kazu is all too happy to greet me with a big smile and welcome. You can tell straight away that he is passionate about what he does and his roots. 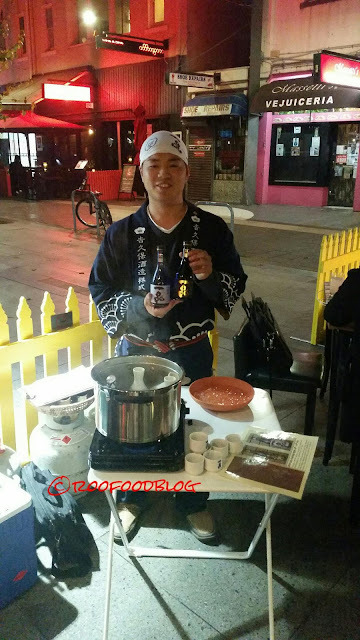 Only opened for two months now, Kazu and his delightful wife who own Osaka has become a hot spot for beer, sake and street food, Osakan style. We start the evening with a Suntory Premium Malt beer on tap. This is a floral, malty beer and it's pleasingly refreshing. I am not a big beer drinker (unless when I'm travelling for some reason) and I liked this alot. After introductions and drinks served, we receive a 'small' serve of takoyaki. 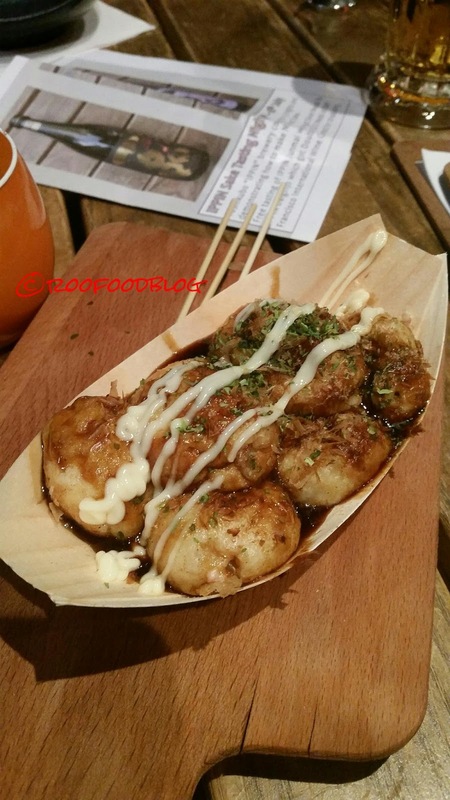 Takoyaki is probably the most well known of Japanese street foods and it also was 'invented' in Osaka. 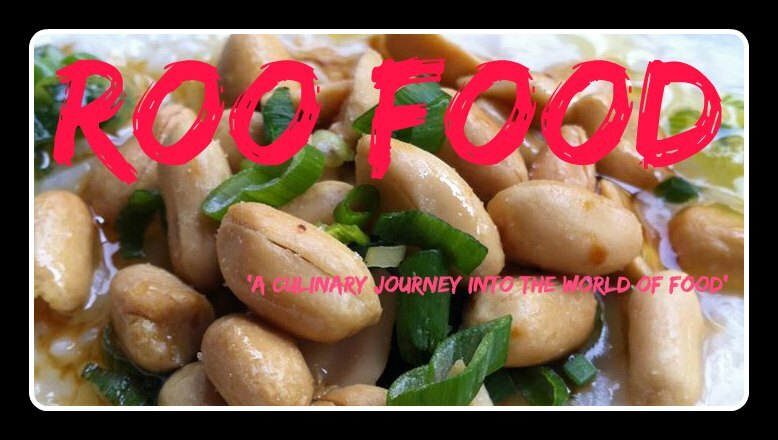 They are popping up at festivals and markets all over Sydney, with a cult like following. Beer was good, however, it didn't take long to start tasting some sake. We also just happened to be here on a night that the Ippin sake tasting was taking place - well planned! As I have mentioned in previous posts, I have only just recently discovered that I like a particular brand of sake. I'm still not a full convert but I think my taste buds are warming up to the idea. 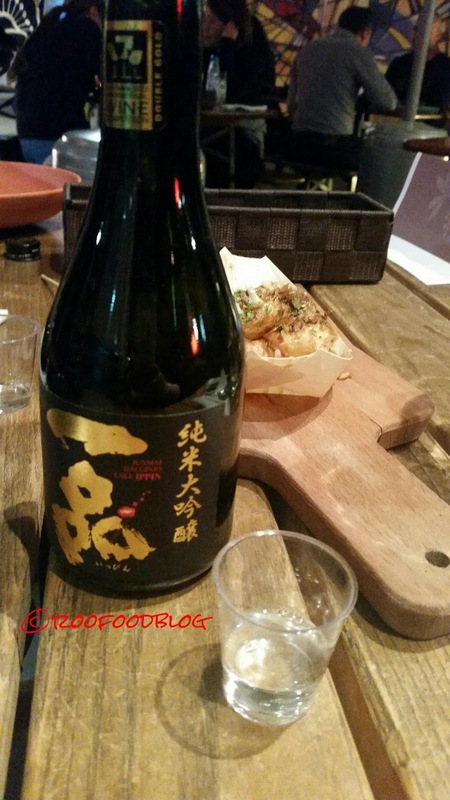 Sato, our sake sommelier, is a family member of the founders of Yoshikubo Sake Brewery Co who brews Ippin. The family have been operating this brewery for 11 generations since 1790. 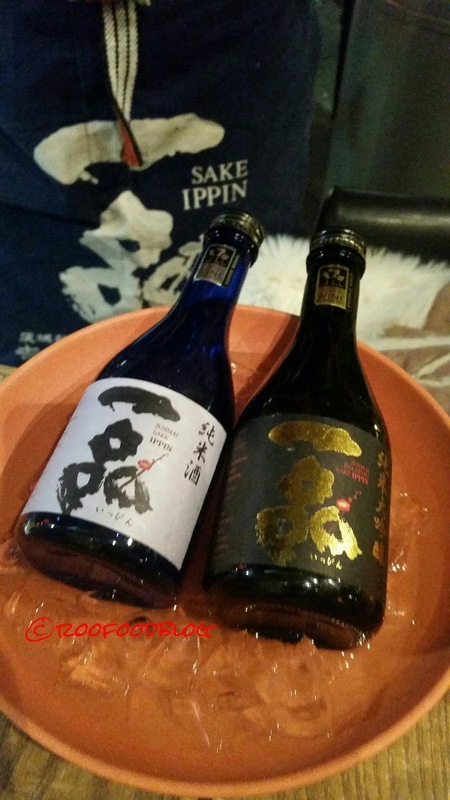 Here we have the Ippin Jyunmai (left), an everyday sake or what I like to call a 'quaffing' sake and the Jyunmai Daiginjo (right), a more premium sake. I prefer my sake cold. The Junmai is served cold (for me) and is crisp and dry. Mr friend A goes with warm. I can assure you that cold sake pairs well with our next dish. 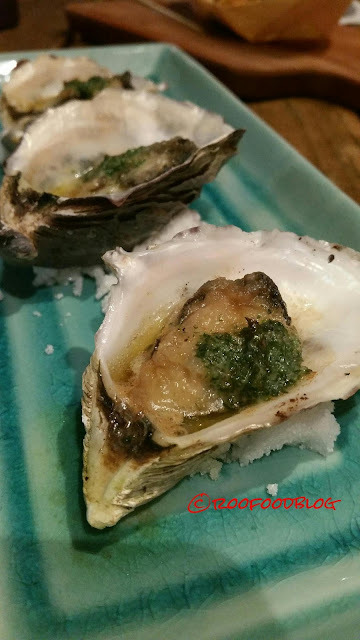 Grilled Oysters with Yuzu soy sauce and garlic butter. Three plump oysters sit atop a mound of rock salt, still warm from the grill. The citrus of the yuzu and the oiliness of the butter are sublime and the hints of parsley make these oysters a perfect bite. Next sake is the premium Jyunmai Daiginjo and this is incredibly smooth on the palate. This is a fav. More dishes followed on. The kitchen was more than happy to bring out a selection of their menu and surprise us. Took the task out of my hand...to hard as there are just to many dishes to sample! 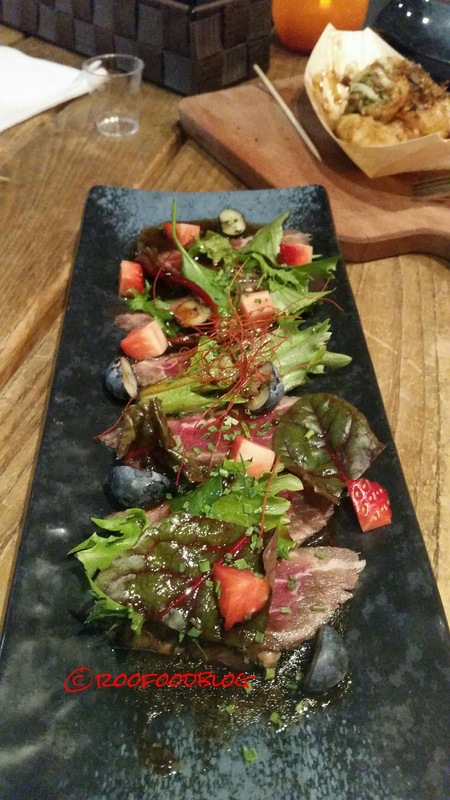 Beef tataki - seared wagyu, soy based wasabi sauce (forest floor garnish - blueberry strawberry). Visually colourful dish, the thin slices of slightly seared rare wagyu is doused in a subtle hint of wasabi sauce with fresh blueberries and strawberries makes for a great snacking dish. Drinking food doesn't all have to be about deep fried and grease! 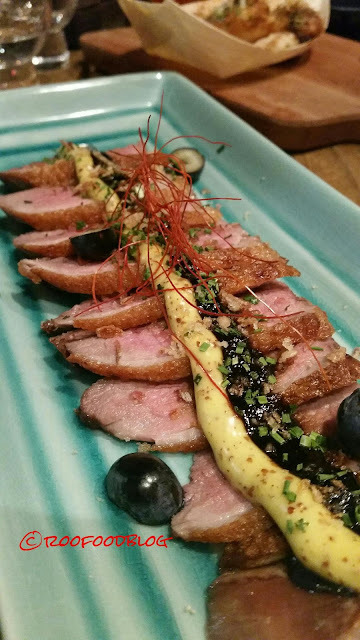 Chef Kazu's signature dish is a beautiful looking Grilled Duck confit - 65 degree duck breast grilled with blueberry miso sauce and honey mustard. I loved this dish. The duck breast was perfectly pink with crispy rendered skin and the blueberry miso sauce blew me away. I think I raved about it all night. 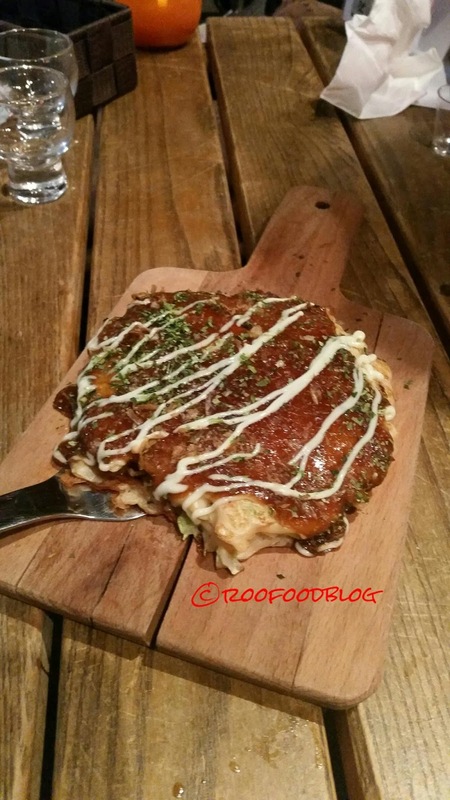 Another well known street food is Okonomiyaki - which is a Japanese pancake mixed with pork, squid and prawn. Osaka Bar's version is fabulous. Full of protein and super crispy this is a good one! 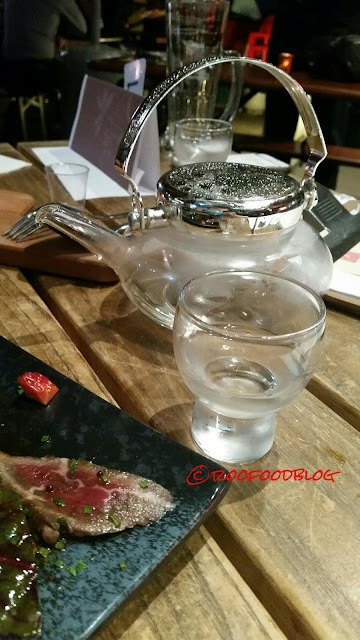 We have now moved on to teapots with the Dassai Junmai Daiginjo , which is a top premium sake, where the grain of rice is polished to 50% of its size, giving a sweeter more refined taste. 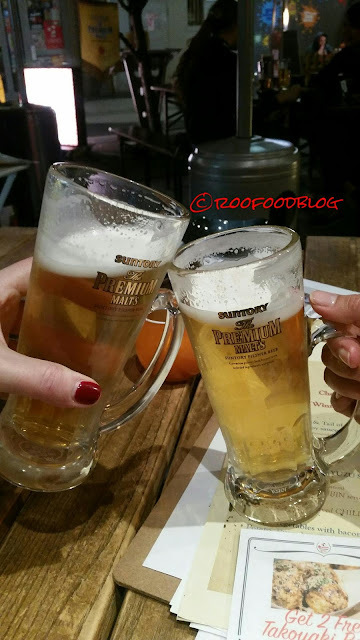 Definitely getting the feel of this drinking street food style of dining! One particular speciality of Osaka is Kushi Katsu. Katsu meaning deep fried. Kushi meaning skewers. 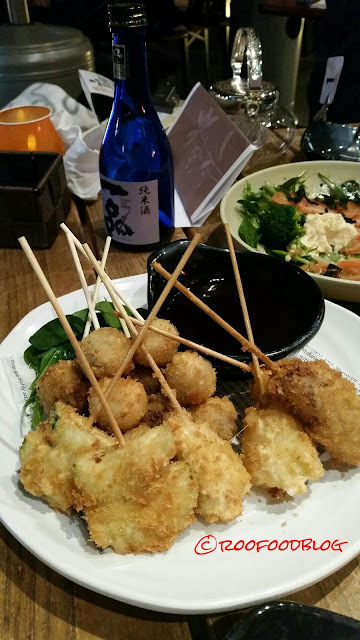 There is a variety of panko crumbed skewers you can choose from and priced per skewer you can pick and choose as many (or as little) as you like. We end up with a selection of five, served with a house secret sauce. The sauce is so good and with a great amount of prompting, conjoling and begging, Chef Kazu would not divulge his secrete. From right clockwise we have beef rump, camembert, zuchinni, potato croquette and beef mince cutlet. The zucchini , potato and beef mince cutlet are the best. 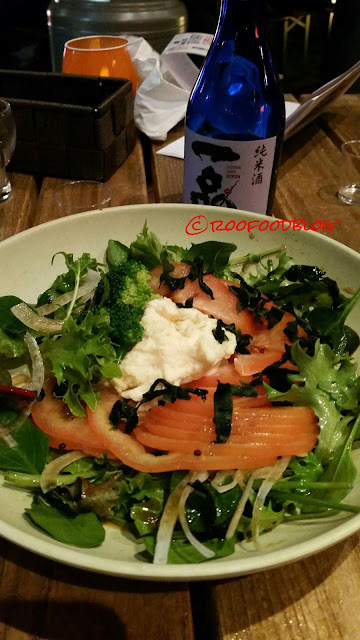 My dining pal A, spies the tomato and tofu salad - with sliced fresh tomato, lettuce and wasabi dressing with silken tofu (which we thought tasted liked mashed potato salad (unless that was substituted?). Lastly, I ordered a serve of the Dote Kushi - slow cooked beef tendon with a sweet miso based broth. I love beef tendon and when prepared and braised well, super tender and gelatinous and tasty. These were great. The miso style sauce is sweet enough to cut through the richness of the tendon. We have admired the bar full of a variety of bottles with labels of unidentified liqueur and are advised that they are Japanese whiskey and Shochu, a distilled beverage most commonly distilled from barley, rice and sometimes sweet potatoes. It has a high alcohol content. 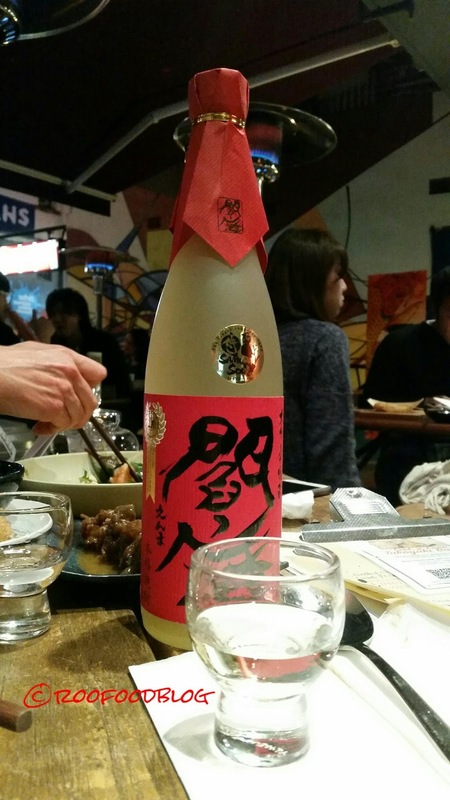 I am told that the large bottle is a rare Aka Kirishima (even rare to find in Japan) distilled from sweet potatoes. At $230 a bottle I can understand the hype about it. 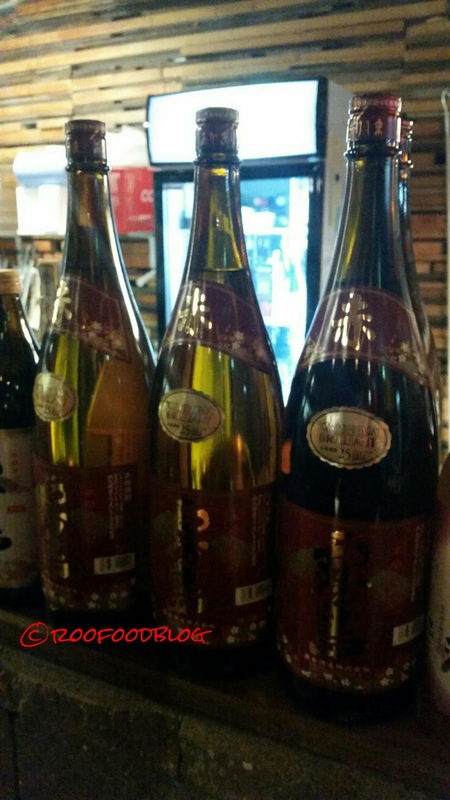 There is also a Aka Enma (wheat based) shochu. I was most surprised when Chef Kazu so generously poured a glass each for us to sip, along with a sample of the Aka Enma. These blow my head off! These are smokey and reminiscent of whiskey, very strong. I do believe we may have ended the night on a Suntory Whiskey too. Thanks Yuri for joining us and sharing many laughs and thank you to the generous hospitality of Kazu and his lovely wife. I'm looking forward to coming back soon for more beer, sake and delicious snacking. Perfect for a date night, a group of friends on a night out or...... well you don't really need an excuse. 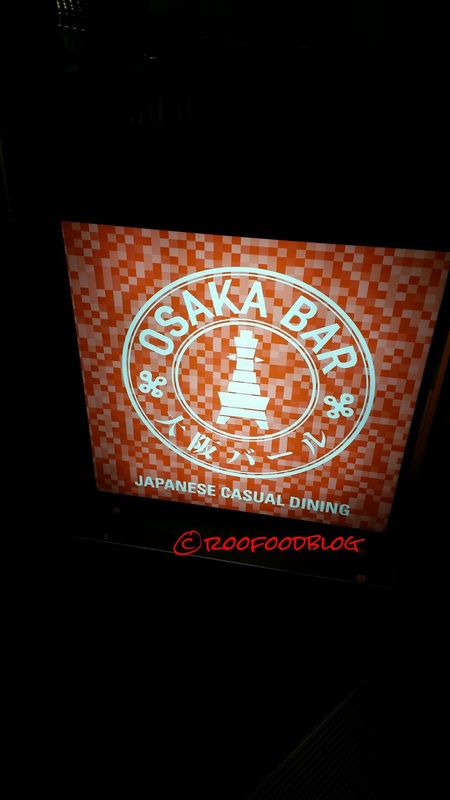 *Roofood dined as a guest of Osaka Bar and SD Marketing - thank you for your generous hospitality! All opinions are my own. 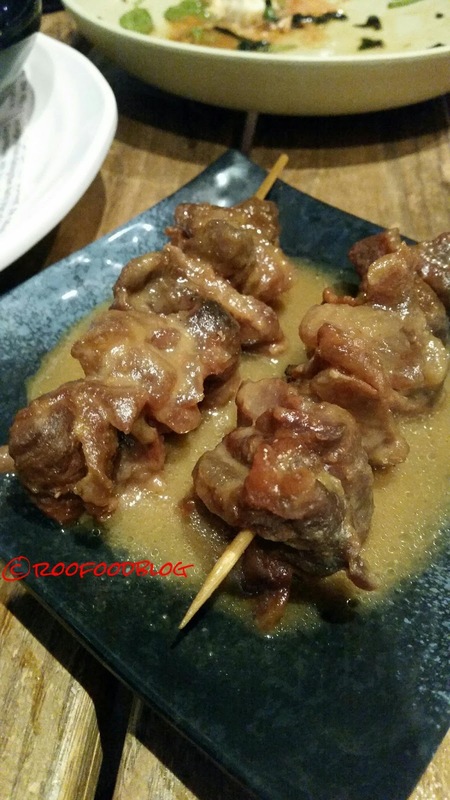 That beef tendon sounds awesome!